You’re looking at a slice of vaping history right here. JoyeTech might be the oldest vaping company that’s never gone out of continuous operation, and they’re not just scraping by — they’re still killing it after all these years. Do you need some evidence of JoyeTech’s lasting influence? Look no further than the eGo e-cigarette, which JoyeTech co-designed. The eGo name has spread so far and wide that it probably remains the most well-known vaping device of all time. JoyeTech isn’t a company that would ever rest on its laurels and content itself with its past successes. To see evidence of a company that refuses to stop innovating, look no further than the fascinating JoyeTech Cubis. The Cubis has a totally unique cup shape with no bottom airflow holes. Since the tank has no holes at the bottom, e-liquid can’t leak out! Air enters through the top of the tank, and leaking is impossible while the tank is upright. JoyeTech Cubis coils are also pretty amazing. Their notched stainless steel cylinders can outlast virtually any other style of coil, and their flavor purity is unmatched. 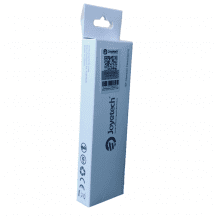 You’ll always find Joyetech coils at the best price right here on this page, and we ship all retail orders for free regardless of size. You’ll find nothing but authentic coils here, and you’ll find nothing but the cheapest Joyetech coils!